Susan Taylor Batten, the president and CEO of the Association of Black Foundation Executives (ABFE), is excited to share the power of philanthropy in Black communities and she sat down with theGrio to talk about it. Just moments before our interview, ABFE held a press conference with the Kresge Foundation to announce big news. The Kresge Foundation is the first private foundation to sign onto ABFE’s Diversity in Foundation Asset Management Pledge. The initiative seeks to secure pledges from 50 foundations by the end of 2021 (ABFE’s 50th anniversary) to place at least 25% of their assets under the management of women and minority-owned firms. The Kresge Foundation is the first to dive in with a 25% by ’25 program in which they have pledged to place 25% of their domestic assets in the hands of women and minority managers by 2025. That statistic is currently about 15% for Kresge. With this pledge that will mean approximately $462.5. million of Kresge’s domestic assets will be managed by women and minorities. Susan Taylor Batten is hopeful that this commitment from Kresge will encourage other foundations to sign on to the pledge. 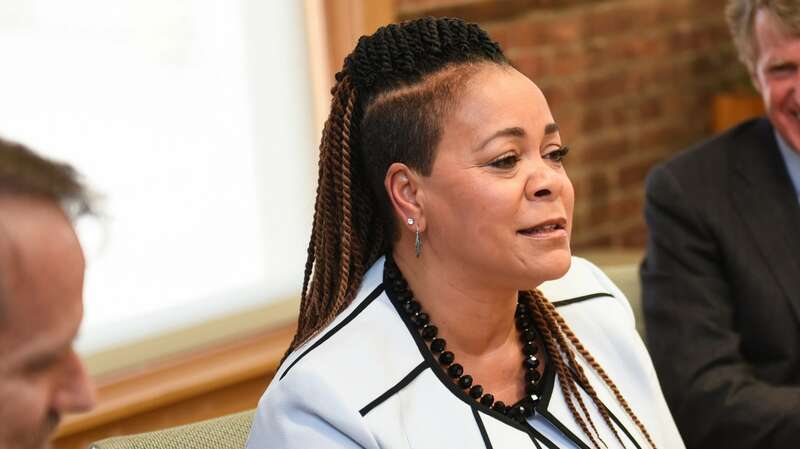 She sat down with theGrio to discuss the new initiative, the ABFE 2019 Conference in Detroit and how philanthropy has always played a major role in Black communities. theGrio: Before you started at ABFE in 2009, you were at the Casey Foundation. How did you land on a service-oriented career path? Susan Taylor Batten: Sometimes things choose you verses the other way around. I often share that I come from a family of helping professionals. My dad was a teacher and taught public schools in Brownsville, Brooklyn for over 40 years and when he left, he ran youth centers at night. My mom was a community health nurse. She helped raise generations of families in Wyandach, Long Island. They were part of the village. I grew up feeling that careers were about helping people. So in a way, I think my career chose me. theGrio: What are you most proud of in the decade since you have been at ABFE? Susan Taylor Batten: I’m really proud about our work in Smart Investing like we talked about this morning and I’m thrilled about the Kresge Foundation announcement. We dared to step into what we call the 95%. Foundations are only required to give away 5% of the interest earned off of their assets in grant-making. The majority of the money is in the endowment. In 2011, we put out a paper called “What about the 95%?” It was a risky call to make because in the affinity group world, we’re all about what foundations need to be doing with their grant-making and we dared to ask what foundations should be doing with their endowment, which is where the real money is. I’m also proud of the more recent focus on investing in Black-led social change. After Mike Brown was killed in Ferguson, we were asked to talk to philanthropy there and it was clear that there were so many strong, grassroots, Black organizations doing work around police accountability way before 2014 and had not received any funding from major foundations. That inspired us to push harder to get funding to Black, grassroots organizations. In 2017, we published a report called “The Case for Funding Black Led Social Change.” We also organized a Black Social Change Funders Network that meets about three times a year. theGrio: What are the benchmarks of success for ABFE? Susan Taylor Batten:We have three high-level indicators for ABFE. People look to us for the tools, information and resources they need to the strongest advocates of the community they can possibly be. The second is, we see the sector better networked and better organized to leverage resources wherever possible. The third thing is we see more resources moving to responsive, effective philanthropy in Black communities. It’s not just about resources to Black-led organizations, but it’s resources to invest in specific strategies that are about building power in our community. theGrio: Some people associate the word “philanthropy” with only the super rich. What have been the barriers you’ve faced with talking about philanthropy in the Black community? Susan Taylor Batten: One of the biggest barriers is the term “philanthropy.” African descendent people are the most philanthropic in the world and we have been practicing philanthropy in our own community in so many ways, we just don’t call it philanthropy. We call it tithing, we call it Harambee, we call it membership dues, and so on. There’s data that suggests that we give away more discretionary income than any other racial demographic in the country, but we also know this is a diaspora phenomenon. We’ve just got to break down the stiff vocabulary that this sector sometimes uses. I’m excited about the rapid growth of Black giving circles around the country. There’s a organization called the Community Investment Network, which is an ABFE partner. It’s an umbrella organization for giving circles across the nation. The barrier is the frame around the perception of words like philanthropy, but the true meaning of philanthropy is love of mankind. We’re reminding folks that this is about love and how to love each other. theGrio: Can you explain how a giving circle works? Susan Taylor Batten: A giving circle is a group of people who agree that they are interested in their community and they want to pool their resources to support an issue, project, or activity. This is where we can demystify issues of philanthropy. I’ve seen giving circles where people are contributing less than $10 a month. It’s the notion of collective giving, which is very much core to our people and our history, that the giving circle model is all about. theGrio: If ABFE’s stated mission of promoting effective and responsive philanthropy in Black communities fully realized, what does that world look like? Susan Taylor Batten: We will see clearly elimination and reduction in some of the glaring racial disparities that we see on every indicator of well-being: education, health, wealth, etc. Disparities are signals and signs of racism and that something is wrong with society. We would see equity in those areas. Our communities would be thriving. I look at it as a reduction of what is burdening us, which is a direct result of anti-Black racism and capitalism. We’re healthy, we live longer, our kids and young people have reached their full potential and at the end of the day, the country is stronger. theGrio: The ABFE Conference is in Detroit this year. What do you want the 400 attendees to take away from the conference? Susan Taylor Batten: I want folks to be informed and hopeful. As I look at the program, it gives me hope. No matter how tough these issues are, I know that there’s a lot of good work going on. If it’s happening in Jacksonville, Florida, it perhaps can happen in Louisville, Kentucky and Detroit can find a way to build on that. I want folks to be hopeful and energized when they leave. It’s important to me that people realize they are not alone, they’ve got a network of support. We want people to go back home to their institutions and foundations and just do their very best, take risks, and use their voice. They come here to gain that energy. The 2019 ABFE Conference is in Detroit, Michigan April 4-6 and brings together 400 grant makers and grant seekers from all over the country. Stay tuned for more coverage of the conference from theGrio’s Senior Editor, Demetria Irwin.